Dimensions: 45.9 x 24.7 x 40.9"
39.9 x 24.7 x 40.9"
45.9 x 24.7 x 40.9"
Measuring 45.9 x 24.7 x 40.9 inches (W x L x H), the Inovativ Voyager 42 NXT with X-Top Keyboard Shelf is an equipment cart designed to carry camera gear, tools, and accessories in the studio and on location. The Voyager 42 NXT requires no tools for assembly/disassembly, so you can build or break down the cart with ease in approximately two minutes. The fixed-height top shelf supports up to four threaded rail plates (available separately) for convenient attachment of 1/4"-20 and 3/8"-16 accessories. The cart and its wheels collapse to a compact flight case that measures 8.25", with a travel handle, integrated rolling wheels, and a spring-loaded latch system. 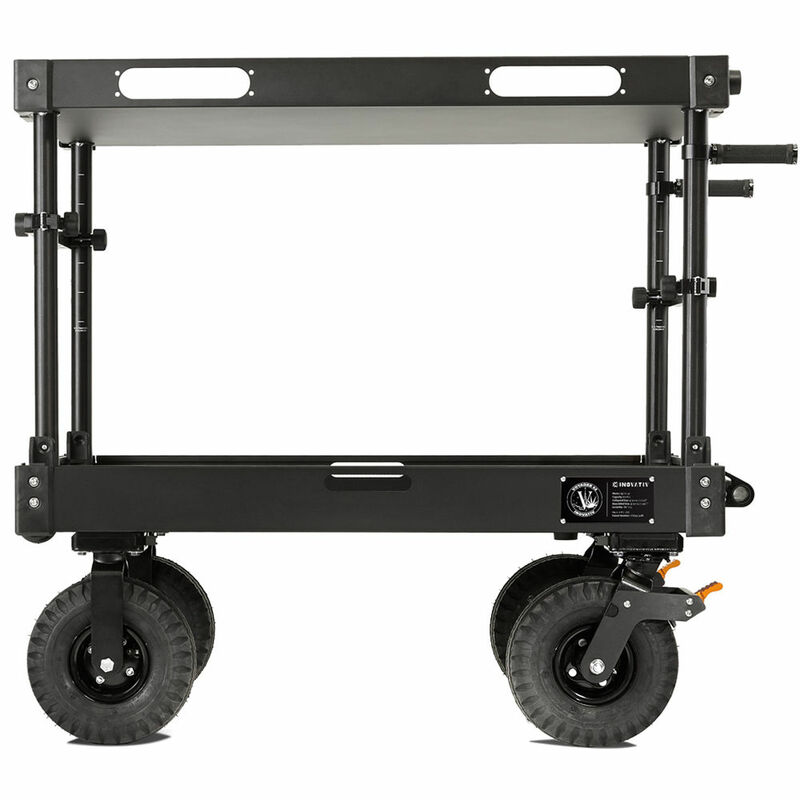 In its flight case form, the cart becomes portable and easily transportable. The cart's adjustable handles simplify movement up curbs, entryways, and inclines. The pneumatic tires incorporate sturdy steel wheels and Inovativ's premium foot brake system. The equipment cart shelves are powder coated, and the uprights and machined parts are type II anodized. The rest of the cart is constructed using 5052 and 6061 aluminum. All Voyager NXT carts are designed and made in the USA with rivet- and weld-free construction. Box Dimensions (LxWxH) 50.75 x 29.25 x 12.0"